Rosie Napravnik, who for the second straight year is running away with the jockey’s title at Fair Grounds, is one race away from hearing the strains of “My Old Kentucky Home” raining down on her again as she parades to the post in the Kentucky Derby Presented by Yum! Brands (gr. I). Napravnik ranks her Kentucky Derby experience last year, especially the “roar of the crowd,” and her victory aboard Pants On Fire in the Louisiana Derby (gr. II) as the highlights of a career that is soaring to new heights. Now she looks to tread upon that same path, but with different results on the first Saturday in May. But first she has to get by the $1 million Louisiana Derby April 1. Napravnik, who currently ranks 14th among the nation’s leading riders in money won and is winning at a 21% clip, is hoping for a déjà vu experience. This time, however, she’ll be looking to take it one step further – a Louisiana Derby–Kentucky Derby double. And she knows it will be in her grasp if she can guide Brereton Jones’ Mark Valeski to victory on Sunday. Unlike Pants On Fire, who was a longshot at Churchill Downs, Mark Valeski is expected to be a strong favorite in the Louisiana Derby following his narrow defeat to El Padrino in the Risen Star Stakes (gr. II). In his first start ever around two turns, the son of Proud Citizen turned in a gutsy performance against one of leading 3-year-olds in the country, battling eyeball to eyeball with him almost the entire length of the stretch. 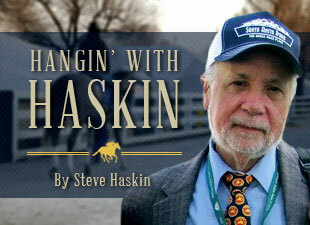 Napravnik is enjoying a career year. Of the top 15 leading money-winning jockeys, the only one with a higher in-the-money percentage than Napravnik (58%) is Ramon Dominguez (60%), who is the leading rider in the country in money won. This weekend alone she has 23 mounts, 11 of them in stakes. Among them is her old friend, Pants On Fire, who she rides in the New Orleans Handicap (gr. II). With 37 mounts in the final four days of the Fair Grounds meet, Napravnik needs seven wins to surpass her meet-leading 110 victories last year. As the first female to win the riding title at Fair Grounds and only the sixth to ride in the Kentucky Derby, Napravnick is continuing the recent tradition of female dominance in the Sport of Kings. But Napravnik’s accomplishments on the track have transcended the phrase “girl jockey.” People are now beginning to recognize her as one of leading jockeys in the country, period. A victory by Mark Valeski on Sunday will bring even more attention to Napravnik than she had last year, as she and the colt’s trainer, the affable Larry Jones, turn on the charm for the news hungry media looking for feel-good stories. To initiate the many play on words that likely will appear, a Rosie by any other name still smells as sweet. As sweet as the Kentucky Derby victory blanket.